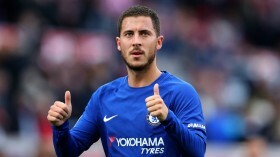 European champions Real Madrid are prepared to lure Eden Hazard from Chelsea in the summer with the same policy used with former Blues goalkeeper Thibaut Courtois. Hazard has just 17 months remaining on his existing deal with the Blues and this has seemingly increased Los Blancos' chances of signing him at the end of the season. According to The Mail, the Spanish giants are prepared to approach Hazard in the same way as they did with Courtois, who was lured from the Bridge last summer. Courtois was tempted to join the Madrid outfit after they gave assurances that they would do anything to sign him and the same technique could be applied to convince Hazard. Meanwhile, there are suggestions that Real Madrid are keen on reducing the overall transfer value below £100m and they could offer one of Isco or Marco Asensio in exchange to do so in the summer.